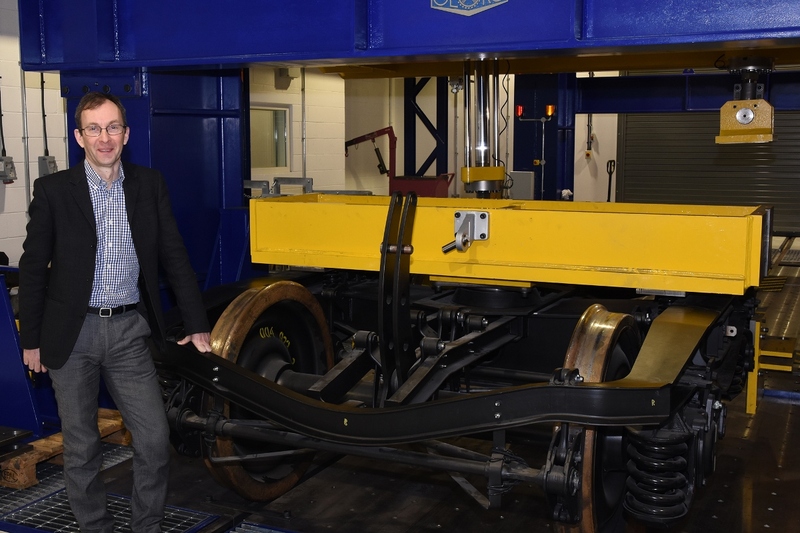 The University of Huddersfield is involved in a project to examine the use of novel materials and 3D printing for lightening rolling stock bogies. Research at the University of Huddersfield could lead to new generations of railway vehicles with carbon fibre frames and key components made using the latest 3D printing technology. The investigation of novel materials and manufacturing processes is being carried out by the University’s Institute for Railway Research, which has been awarded funding of almost £300,000 as part of an EU-backed project to develop lighter, more reliable, more comfortable and quieter rolling stock. “We hope that the result will be a step change in the running gear of rail vehicles,” said the IRR’s Director, Professor Simon Iwnicki. The aim is to explore the potential – and any shortcomings – of new materials. The benefits would include reduction in the weight of bogies, simpler designs and reduced life cycle costs. RUN2RAIL is the overall title of the new project. It is an element of the EU’s multi-faceted Shift2Rail programme, which fosters research and innovation in European railways. The total funding allotted to RUN2RAIL is 2,732,000 euros, and it has four work packages, shared by major engineering companies and universities throughout Europe. The Huddersfield Institute is participating in three of the packages, and is the lead institution for the project to investigate optimised materials for running gear. It will work with the Politecnico di Milano, consultants RINA and the Italian engineering and design company Blue Group. Professor Iwnicki explained that it was the Institute’s expert knowledge of the design of railway bogies and their dynamic behaviour that was being harnessed for the work package. At a kick-off meeting in Milan with the partners, it was decided to investigate the use of carbon fibre composites, which would enable bogie frames to be constructed layer-by-layer by robots. Another strand of investigation will be the use of additive manufacturing – or 3D printing – done with lasers and steel powders. This technology is becoming more mature and components, such as axle boxes and brackets for brakes are now candidates for this process. Although one engineering firm has produced a railway bogie that includes carbon fibre leaf springs, the RUN2RAIL project could lead to unprecedented usage of novel materials in rolling stock construction. For the moment, wheels will probably still be made from conventional steels, however. “We have considered using alternative materials for wheel hubs or axles, but the failure modes and risks are not yet fully understood. But we are looking at it,” said Professor Iwnicki. The RUN2RAIL project is now under way and is due to be completed by August 2019.